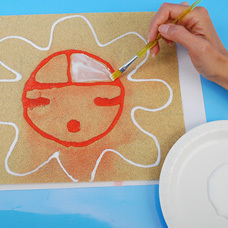 "Paint" a sun sand art project using craft sand and glue! 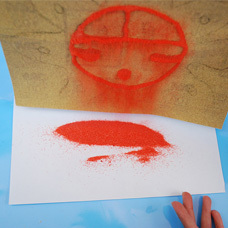 This Hopi Sand Art design is based on the sun. 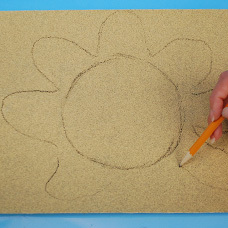 To start, draw a large circle in the middle of the sandpaper. Add oval shapes around the circle, almost like petals around a flower. 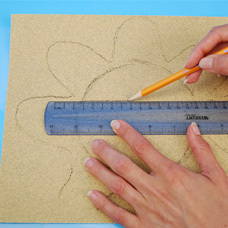 Use your ruler to draw a line across the sun, a little more than ½ way up to begin filling in the face. Draw a second line from the top middle of the circle to the line you just drew. 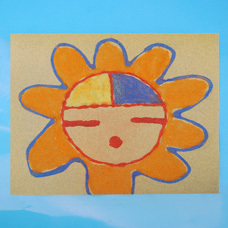 Draw a circle as a mouth below and rectangles as eyes that go on the edge of the sun’s face. Plan your colors. Mark each area with an initial for that color name. For example, O = orange, G = green. 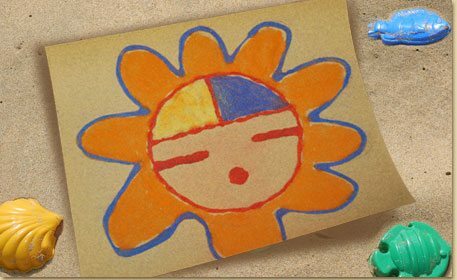 Lay your artwork on a piece of scrap paper. 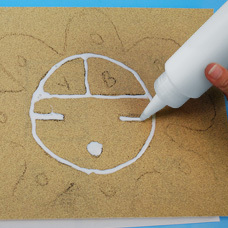 Begin with the face shape by drawing an outline with your glue bottle. Choose one color to start your design. Snip the end of your bag of sand so it’s ready to pour. 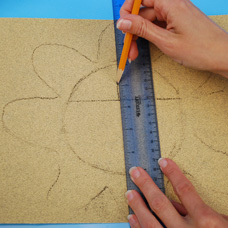 Pour the color sand onto the glued area. If it pours outside the glued area, it’s okay! The sand will only stick to the glue. 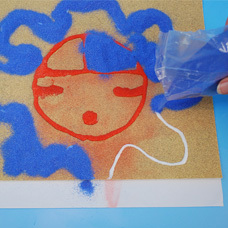 Gently shake the sand off the painting onto the scrap paper. 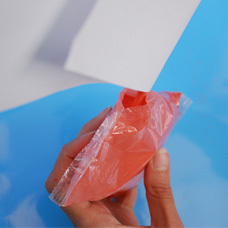 Use the scrap paper to funnel the extra sand back into the bag. You might need the help of an adult for this step! For larger areas, you might want to paint on the glue for full coverage. 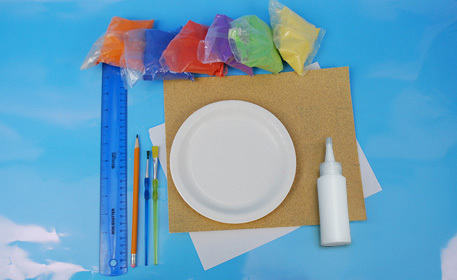 To do this, pour some glue onto a disposable tray or plate. 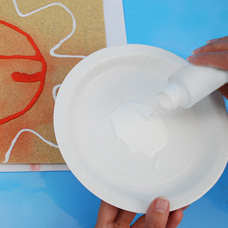 Use your paintbrush to paint areas with glue or use the bottle to outline the shape. In this case, we wanted to use the color blue in two different areas so we tried both techniques. Repeat Steps 7-9 with this second color of sand. 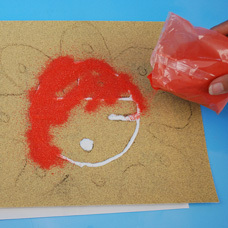 Repeat the steps to add glue and fill in each area with different colors of sand until you have completed your design. 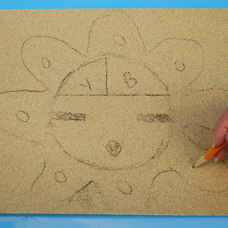 Let your sand art design dry and put this bright Hopi inspired Sand Art masterpiece on display in your home!